Gas and oil companies reported almost 1,000 spills to Colorado regulators over the past 2 1/2 years, reports Burt Hubbard of the Denver Post. The spills - some 5.2 million gallons of drilling liquids and oil - ranged from small valve leaks to thousands of barrels of contaminated water from faulty pits. What leaked? Of the 981 company-reported spills, formation-produced water (brine) and frack fluid used in drilling accounted for nearly half - 461 - and about 85 percent (106,000 barrels) of the amount spilled. The 319 oil spills accounted for only 6,500 barrels of the total spilled. One hundred eighty-two spills impacted groundwater, 82 contaminated surface water, and another 10 impacted both groundwater and surface water. While drillers in Garfield County reported about a quarter of the total spills (236), they accounted for the highest volume of material spilled - some 66,386 barrels, mostly drilling liquids and water used in natural-gas exploration. So far, Colorado officials have levied only two fines, totaling nearly $650,000. Both were against Oxy USA in 2008 for contamination of two springs near Parachute caused by leaks from pits containing drilling wastewater and hydrocarbons from oil and gas. State investigators found elevated levels of benzene in the springs. David Neslin, director of the Colorado Oil and Gas Conservation Commission, said many of the spills are small with no real environmental impact, while the state requires remediation for spills that affect the ground and water sources. "Our reporting requirements are very low," he said. Companies are not required to publicly disclose the mix of chemicals used in frack fluids. But, Neslin added, Colorado's new regulations went into effect last year, and they require that companies disclose the content of frack fluids in spills if the state asks. Neslin said the state has concentrated its efforts on new rules designed to minimize the impact of spills. For example, keeping drilling operations farther from water sources and people. Read Denver Post article here. 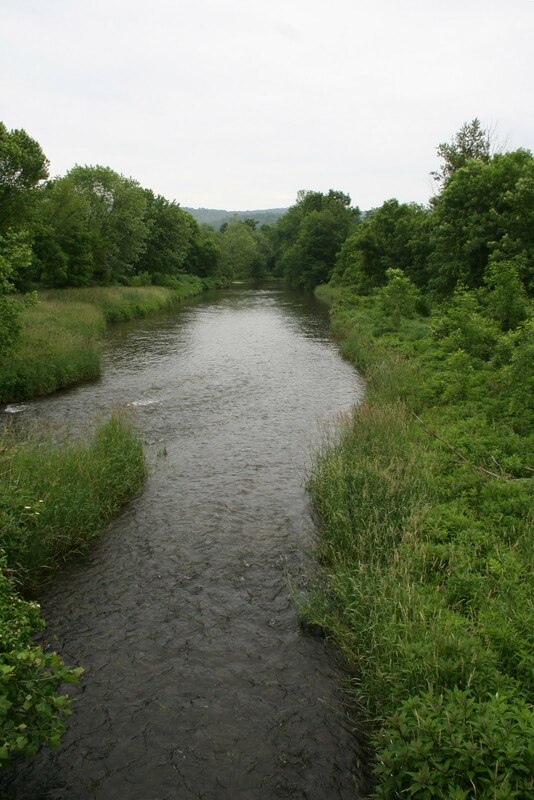 Riverkeeper is one of the premier organizations dedicated to keeping New York's water clean. Their mission: to protect the ecological integrity of the Hudson River and its tributaries, and to safeguard the drinking water supply of New York City and the lower Hudson Valley. They started about 40 years ago, but under a different guise - the Hudson River Fisherman's Association. Now they've got a "Don't Frack with NY" campaign going, to educate residents of the Big Apple about where their water comes from and how to protect it. You might have heard something on NPR about tap water taste tests in NYC.... and the campaign to get people to stop buying bottled water and carry a re-fillable water bottle for tap water. A sort of "drink local" campaign designed to reduce plastic bottle waste. Great idea. But, as the Riverkeepers say, you can't "drink local" if you pollute the source. You can check out their site at Don't Frack with NY! (CPNY). Sessions focused on a diversity of land issues and health concerns, but the central focus was fracking. 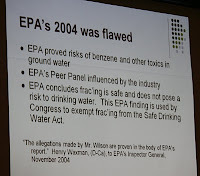 Wilson, an environmental engineer with the US Environmental Protection Agency (EPA) reviewed what went wrong with the 2004 EPA report on hydraulic fracturing of coal bed methane reservoirs. EPA scientists proved that there was a risk of benzene and other toxic chemicals migrating into ground water from drilling activities. But, Wilson said, heavy industry influence on the panel reviewing the report suppressed this data from the final report. The 2004 study is flawed. And it is those flawed findings that were used by congress to exempt the process of hydro-fracking from the Safe Drinking Water Act. “Things have changed now,” Wilson said. “The EPA is beginning a new study on hydro-fracking, but even with $1.9 million it is underfunded.” The new study promises to be broader in scope, looking at impacts of the entire life cycle of gas drilling. And it won’t be limited to coal bed methane, Wilson pointed out. The new study promises to be more transparent, too, and peer-reviewed. But that doesn’t mean it’s perfect, Wilson warned. The EPA isn’t interested in studying Dimock, PA or Hickory, or Pavillion, Wyoming, or any of the places that have already experienced water contamination related to drilling activities. Wilson listed a number of risks that drilling dependent on high-volume hydraulic fracturing presents. Spills – especially spills of undiluted fluids or chemicals – topped his list. While he admitted that the bulk of fracturing fluid is benign, Wilson pointed out that chemicals are added to thicken and thin the drilling mud as needed. The storage and movement of these undiluted chemicals produce an opportunity of risk, he said. Storing frack fluid in pits creates pathways of exposure via both an air and water. Air emissions, from the volatile chemicals in the fluid, present a temporary risk – unless you are a worker suffering chronic exposure to the chemicals. Leaking pits create long-term risks that may remain hidden for decades. Fracking fluids can also mobilize toxics that are present in the rock formation, such as radon and other Naturally Occurring Radioactive Materials (NORM). Production fluids – the brines that come out of the rock formation – contain both frack and formation toxics. Make sure that your state requires ground-water testing and monitoring prior to drilling – ambient air monitoring, too. Support the current EPA Fracking Study (see below). EPA is hosting four public information meetings on the proposed study of the relationship between hydraulic fracturing and its potential impacts on drinking water. The meetings will provide public information about the proposed scope and design of the EPA “Fracking Study” and will offer an opportunity for local residents to comment on the draft study plan. While hydraulic fracturing is one way of accessing natural gas, the EPA notes that serious concerns have been raised about the potential impact of fracking on drinking water, human health and the environment. To address these concerns, EPA announced in March that it will study the potential adverse impact that hydraulic fracturing may have on drinking water. To support the initial planning phase and guide the development of the study plan, the agency sought suggestions and comments from the EPA Science Advisory Board (SAB)—an independent, external federal advisory committee. Now they are inviting individual citizens, communities, tribes, state and federal partners, industry, trade associations, environmental organizations and other stakeholders to provide input to guide the design of the study. You may also submit written comments at the meeting; by e-mail to hydraulic.fracturing@epa.gov; or mail written comments to Jill Dean, 1200 Pennsylvania Ave. NW, Mailcode 4606M, Washington, DC 20460. One thing EPA and other officials emphasize when they talk about hydro-fracturing shale wells or converting old Trenton-Black River wells into underground disposal wells: Make Sure All Abandoned Wells in the Area Are Plugged! You can even hear them capitalize each word when they speak. So today's news from the Pennsylvania Department of Environmental Protection is good news for the people in Erie County. DEP announced that between December 2009 and March 2010 they "successfully eliminated potential pollution and public safety hazards" by plugging 11 abandoned gas wells. The problem with abandoned gas wells, says DEP Northwest Regional Director Kelly Burch, is that they "can pollute streams and drinking water supplies and, in some situations, pose explosive dangers to nearby residents and communities. This is a public safety concern, as well as an environmental protection issue." Five of the 11 wells were in the City of Erie, four in Millcreek Township, one in North East Township, and one in Girard Borough, some located in densely populated neighborhoods. Many of the plugged wells had been venting gas or were found as a result of gas migration problems. So, who pays for plugging abandoned wells? According to DEP these 11 wells were plugged using Pennsylvania’s Orphan Well Plugging Fund - at a cost of $137,348. The plugging program is funded by a surcharge on drilling permits, with as much as $200 from an individual permit fee going to the fund. DEP also notes that Pennsylvania has the greatest number of abandoned wells in the Appalachian region, and is ranked one of the top five states nationally. They've documented more than 8,700 wells throughout the state that were abandoned before passing modern oil and gas drilling regulations. Laura Legere, staff reporter for the Scranton Times-Tribune, has been following Marcellus drilling for awhile - but this week she has pulled together quite a series of articles. Grab some coffee and start reading. On second thought, skip the coffee - the stuff she writes about will make you too sick to drink it. Despite recommendations to designate the local aquifer as a Critical Environmental Area (CEA), the Candor Town Board nixed the idea - and it wasn't even on the agenda. 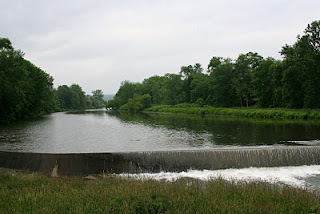 Earlier this month Steven Winkley, a source water protection specialist from the New York Rural Water Association, urged the town to designate the aquifer as a CEA. The aquifer provides the sole source of water for every resident - and business - in town. And Winkley isn't the only one; his suggestion comes on the heels of similar recommendations from the County Department of Health as well as Tioga County Investigates Natural Gas (TING). Judging from comment made at the June 8 town board meeting, the local municipal officials are woefully uninformed about what CEA designation means for both the aquifer and the town. "Designation as a CEA would burden us from proceeding with gas drilling," said one board member. It won't. Town supervisor Darlene Cobler agreed, mumbling that there would be no CEA designation if such designation meant that the majority of the acreage in town would be off limits to drilling. It doesn't. Local, county and state agencies use the Critical Environmental Area (CEA) designation to protect their natural resources. By identifying the most – and least – suitable locations for business and development infrastructure, CEA designation helps town planning boards facilitate effective land-use policies. To designate a local wetland, town park or village cemetery as a CEA, an agency must show that the area has an exceptional or unique character with respect to one or more criteria: Does it provide a benefit (or threat) to human health? Is the area a natural setting that provides wildlife habitat, forest and vegetation, or open space with important aesthetic or scenic qualities? Is the area unique for its agricultural, social, cultural, historic, archaeological, recreational, or educational values? Or are there any inherent ecological, geological or hydrological characteristics that may be adversely affected by any change? The crucial thing to remember, says Bob Ewing of NY Department of Environmental Conservation (DEC) is that CEA designation does not prohibit development. While it does play a crucial role in allowing communities to retain control over their most valued resources, CEAs do not offer the legal protection provided by land use controls such as zoning. They simply encourage more thorough examination of proposed development projects. Designating an aquifer as a CEA means that when development is considered, the agencies filling out the environmental reviews have to give more specific responses to the questions on the SEQR (State Environmental Quality Review). But designation as a CEA does not trigger a SEQR where one would not normally be required. While CEA designation heightens the awareness of that resource during an environmental review, it does not add more regulation. Even if a town goes through the CEA designation process, that action does not grant the town any permitting authority, zoning restrictions or other jurisdictions that do not already exist. So why should Candor designate the Catatonk Creek Aquifer CEA status? Other towns, including Virgil and Homer, have designated their sole-source aquifers as CEAs (you can read Virgil's here). They have also written zoning ordinances that prohibit industrialized and polluting activities from locating over the aquifer. So why not Candor? 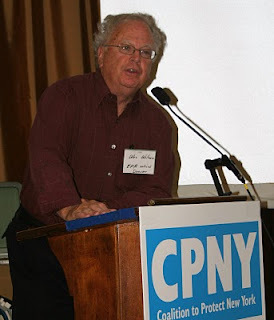 Do the town board members not understand what CEA designation really means? Or are they afraid that an election-year move to protect the town's only water source will send the wrong message to constituents hoping to cash in on the Marcellus gas rush? Today, the Pennsylvania state Independent Regulatory Review Commission approved new rules that will protect Pennsylvania’s streams and drinking water supplies against total dissolved solids (TDS) pollution from Marcellus Shade drilling wells. The new rules ensure that rivers and streams do not exceed the safe drinking water standard of 500 milligrams per liter. "Millions of Pennsylvanians rely on the state’s rivers and streams for drinking water," Governor Edward Rendell told the press. "So we cannot allow new, heavily polluted sources of wastewater to contaminate them. That’s why these regulations are so important." The new regulations now await review from the environmental resources and energy committees in the state house and senate. John Hanger, Secretary of the Department of Environmental Protection (DEP) noted that as the drilling industry expands their activities in the Marcellus Shale, the volume of wastewater returned to Pennsylvania streams could increase exponentially. "The only way to protect our water resources is to implement new wastewater treatment standards for the drilling industry," Hanger said. "All other industries are responsible for the waste they generate, and the drilling industry should be no exception." Hanger noted that drilling wastewater contains very high levels of chlorides and sulfides, dissolved solids that contribute to the TDS measure. These must be removed from wastewater before the effluent is discharged into surface waters. High TDS levels have damaged industrial equipment, caused drinking water companies to issue drinking water advisories and even led to a massive fish kill on Dunkard Creek. Some of Pennsylvania’s rivers are already nearing their capacity to absorb and dilute additional levels of TDS. Several states, including Texas, Oklahoma, New York, Iowa, Virginia, Arkansas and Tennessee, prohibit returning any drilling wastewater to streams. Read the DEP press release here. On Tuesday night, residents from Tompkins County met with DOT officials to talk traffic. Specifically, heavy trucks. The public meeting was originally intended to address the heavy trash-haulers who take to rural roads in order to bypass thru-way tolls. But that impact pales in comparison to the potential consequences of truck traffic created by natural gas drilling in the Marcellus Shale. According to Department of Environmental Conservation (DEC) documents and other estimates, it will take upwards of 10,000 trucks to haul the drilling rigs, equipment, chemicals and millions of gallons of water needed to drill each well. "When they start issuing (drilling) permits is too late to regulate that truck traffic," said one resident. "Let's be proactive and regulate it now." The DOT oversees permits for oversize and overweight trucks, and those permits could apply to trucks involved in gas drilling, say DOT officials. But newly enacted restrictions on which roads trucks will be allowed to use don't apply to local deliveries. Apparently DOT believes well pads in rural areas might be considered "local deliveries". Counties and municipalities in the region are crafting "road use agreements" and even local ordinances that would require drilling companies - and others - who create road damage through heavy truck traffic to pay for road repairs. Unfortunately, those are left up to the individual towns, and some town and county officials would like to see the state take action to help them in road matters. 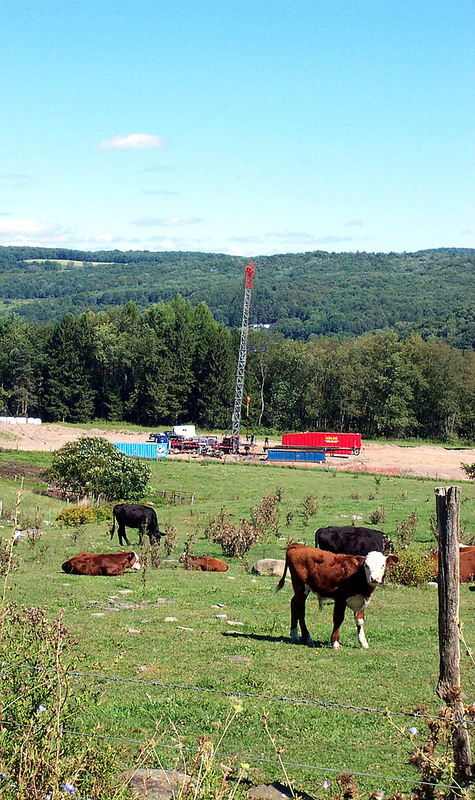 Will NY put a 1-year Moratorium on Fracking? Yesterday a bill that would put a one-year moratorium on new natural gas drilling permits in New York received the backing of key lawmakers in the State Senate and Assembly. 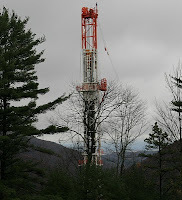 The bill would suspend - until June 1, 2011- hydraulic fracturing for the extraction of natural gas. The process, which locals refer to as "fracking" has been the source of much controversy between pro-drilling landowners and those landowners who would like to see the state adopt more environmental protections. The chairmen of the Environmental Conservation committees, Sen. Antoine Thompson, D-Buffalo, and Assemblyman Robert Sweeney, D-Babylon, Suffolk County, are sponsoring the bill. The measure passed the Senate Environmental Conservation committee on Monday, but it was unclear if or when it would be brought to a vote of the full Legislature. According to press reports, Thompson said NY needs more time to draft regulations and other laws that will be needed to ensure any drilling is done safely. "If it's going to be done, it has to be done in a responsible way," Thompson said. 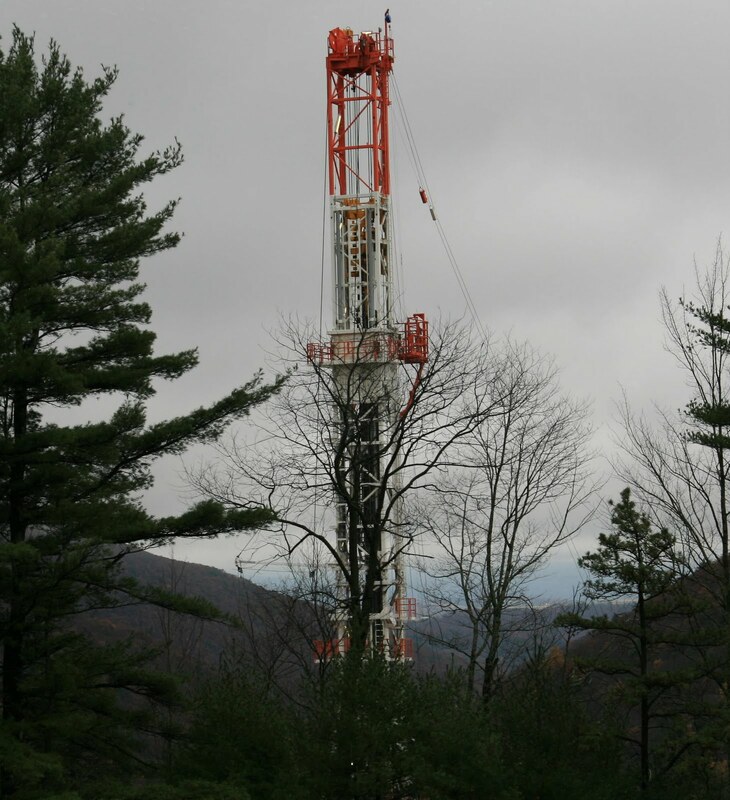 This isn't the only legislation to deal with drilling in the Marcellus Shale formation. Earlier this month, the Assembly Environmental Conservation Committee passed a measure that would enact a moratorium for 120 days after a federal environmental-impact study on the practice is finalized. No one should be surprised that the industry opposes such measures. Brad Gill, executive director of Independent Oil & Gas Industry- NY (IOGA) told the press that "What New York needs now is leadership toward a new energy economy for our state, rather than another bill rife with inaccuracies and false assumption." Having listened to Brad Gill's spiel at numerous presentations I'm not sure it's the proposed legislation that is "rife with inaccuracies and false assumptions." After all, he continues to insist that hydrofracking - a process that is fairly new - has been "done safely in NY for more than 50 years." "If we knew then what we know now, we would have done things differently." At least that's the message from Sarah Fullenwider, a senior assistant attorney for Fort Worth, TX. Last month she shared her insights during a Penn State webinar. Ten years ago, says Fullenwider, there were no gas wells in the city. Now there are 1,675 shale-gas wells within the city limits and over 100 brine disposal wells in the area. She explained that the Texas Railroad Commission regulates drilling and safety issues, while towns and cities regulate quality of life issues such as noise levels and fences. Counties, apparently, have no regulatory authority. Drilling began in the rural areas first, Fullenwider said. Then, in 2004, there was a sharp increase in the number of wells drilled, and drilling operations began moving into more populated areas. People were happy to receive $25,000/acre, but by 2008 those bonuses fell to a tenth of that: $2,500 – 5,000/acre. In addition, the public grew increasingly dissatisfied with noise, dust, traffic, lights, water usage and other environmental concerns that the city had neither predicted nor planned for. The most important lesson Fullenwider stressed was that people need information. “You can’t educate your citizens too much,” she said, adding that she wishes Fort Worth had taken a more pro-active role in getting information to residents. Her recommendations: create a website, saturate the public with information, hold town meetings that bring together citizens, the industry and the regulatory agencies. And make the landsmen register. Fort Worth residents who wanted to see the economic benefit of drilling became frustrated by the inequalities in leasing bonuses and royalties offered to different landowners. In addition, residents are frustrated by their inability to control, through their municipal government, the location of wells. “We really need to deal with current and future land use,” Fullenwider said. Town governments need to get a better handle on industry’s need for compressor stations, disposal wells, pipelines and other infrastructure and integrate those needs with their town planning. Fort Worth had ordinances for noise, lights, water use, truck traffic, setbacks, frack pits, landscaping issues, delivery times (of chemicals and equipment), and fences. "But," said Fullenwider, "we could have required greater setbacks." And she felt the city should have established a baseline for ambient noise levels prior to the influx of industrial drilling. Truck traffic and the resultant road impacts have turned out to be the biggest issue for Fort Worth. In addition to wear and tear on the roads, they felt a huge impact on traffic flow.Although Fort Worth requires a bond before drilling, Fullenwider feels a better solution would have been to implement a road repair fee. “The two areas we missed early on were pipelines and compressor stations,” Fullenwider said. Now, pipelines are causing havoc in both the urban and rural areas around Fort Worth. The problem: companies don’t share pipelines. Furthermore, the pipeline company has power of eminent domain. And compressor stations, too, as they are considered part of the pipeline. These are industrial facilities, Fullenwider emphasized. Towns need to establish setbacks for them, establish maximum noise levels, and establish containments such as fencing. “You need to establish ordinances because, while drilling is over in 40 days, the compressor stations are there for the long haul.” She also noted that disposal wells are becoming an issue. But most of all, Fullenwider said, require an Environmental Impact Statement for each well. According to AP reports, the West Virginia Department of Environmental Protection issued two violations against an Ohio gas company and ordered it to stop all operations in West Virginia until the cause of a rig explosion that injured seven workers is determined. DEP regulators cited AB Resources PA LLC of Brecksville, Ohio, for failing to comply with its permit plan, and said those failures may have created the conditions that led to Monday's blast near Moundsville. Union Drilling Inc. of Fort Worth, Texas, was sinking a well for AB Resources and another company, Dallas-based Chief Oil & Natural Gas, when it struck a methane pocket in an abandoned coal mine it had been drilling through. 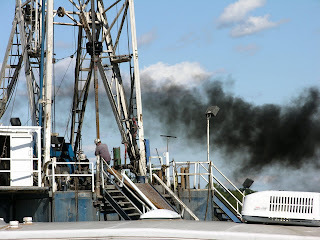 As the crew began to remove the drill string early Monday morning, the methane exploded. According to DEP the crew failed to set casing - the steel pipe that seals off water and gas - at the required depth. AB Resources also inaccurately reported the depth of the coal seam underneath its operation, the agency said. None of the companies involved in the Moundsville explosion had been charged with safety violations in West Virginia, but federal records show that Union Drilling has paid $226,000 in fines for safety violations over the past five years. According to the AP report, the Occupational Safety and Health Administration conducted 20 inspections of Union Drilling operations around the country since February 2006, and 13 of those resulted in violations. Read more here. DEP to Well Contractor: "Halt All Activities in PA"
Today, the Pennsylvania Department of Environmental Protection (DEP) ordered C.C. Forbes, of Washington, PA, to suspend all post-hydraulic fracturing activities on Marcellus Shale wells in the state immediately. 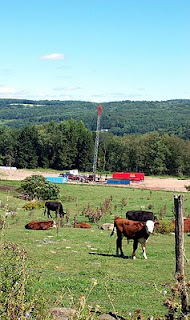 DEP is currently investigating the June 3 well blowout in Clearfield County. According to DEP Secretary John Hanger, EOG Resources - the company that owns the well in Lawrence Township - hired C.C. Forbes as a contractor to provide post-fracking services at the site. DEP’s order not only demands the company suspend all post-fracking activity, but also requires C.C. Forbes to provide site and equipment records specific to the Punxsutawney Hunting Club 36H well, including any written, photographic and video documentation. The company must also furnish the names of its employees who were working at the site or have knowledge of the equipment used there. The secretary said those employees must be made available to the department for questioning. “We need to fully investigate the equipment used by this company to ensure that other sites in Pennsylvania are not in danger of experiencing similar blowouts that could place the public or our environment at risk,” said Hanger. “This was a serious incident that could have resulted in the loss of life or significant damage to our natural resources and the department is prepared to use all means necessary to find the cause of the blowout. “It is imperative that C.C. Forbes provide all records related to the equipment it used, as well as access to its employees that were present when the incident occurred,” Hangar said. Crews drilling for natural gas in Marcellus Shale aren't the only ones having difficulties this week. A utility company accidentally hit a large natural gas line near Cleburne, Texas on Monday. The pressurized gas erupted, sending a column of fire into the air and killing one worker. The blast was so severe that the closest resident said. The force of the blast was so strong, it blew an auger that weighs roughly one ton nearly a football field away. You can read the news report here. One thing we should know by now: natural gas explodes, whether it's bubbling up through an ocean drilling rig or a well drilled into Marcellus shale. Yesterday a crew drilling a natural gas well through an abandoned coal mine near Morgantown, West Virginia hit a pocket of methane gas that triggered an explosion, burning seven workers. According to AP reports, the explosion happened about 1:30 a.m. in a rural area outside Moundsville, about 55 miles southwest of Pittsburgh. A column of fire shot at least 70 feet high, but the flames fell to 40 feet within hours. Gas continued to burn late Monday afternoon. Read more here. DEP Secretary John Hanger said that while the order bans all drilling and hydrofracturing, or fracking, operations for specified periods of time, the suspension will remain in effect until DEP has completed a comprehensive investigation into the leak and the company has implemented any needed changes. The order prohibits EOG Resources from drilling activities up to seven days; from engaging in fracking operations up to 14 days; and from completing or initiating post-fracking operations for 30 days in any wells throughout the state. These actions and operations cannot resume until the department agrees that the investigation has been fully completed. The results of the investigation will also help determine whether DEP should take additional enforcement action against the company, such as fines or penalties. So far, Hanger notes that EOG Resources has been fully cooperative and in agreement with the department’s ongoing investigation and orders. At 8 pm on Thursday, June 3 the well’s operators lost control of it while preparing to extract gas after fracking the shale. Natural gas and flowback frack fluid shot 75 feet into the air, and spilled on surrounding ground. The well was finally capped at around noon on June 4. The well was one of four located on the EOG well pad in a rural area near the Penfield/Route 153 exit of Interstate 80 in northwestern Clearfield County, near Moshannon State Forest. The secretary noted that the company expects to have a more accurate estimate of the amount of fracking water that was leaked after it finishes draining the pits and waterboxes it deployed to collect the fluids. As of June 7, initial estimates totaled 35,000 gallons, although more was certainly released and the company believes this accounts for a majority of the leaked water. DEP’s preliminary investigation has determined that a blowout preventer on the well failed, but the agency does not yet know if that failure was the main cause of the incident. The blowout preventer has been secured and will be one piece of the investigation. EOG Resources, formerly known as Enron Oil & Gas Co., operates approximately 265 active wells in Pennsylvania, 117 of which are in the Marcellus Shale formation. Natural gas and drilling fluids began spewing from an out-of-control well in Moshannon State Forest (Lawrence Township in Clearfield County), PA last night. It took 16 hours, but now state environmental officials say that the well - drilled by EOG Resources, Inc (formerly Enron Oil & Gas) - is under control. The leak happened at a Marcellus well being drilled on McGeorge Road, causing evacuation Friday morning. According to media reports, State Department of Environmental Protection (DEP) spokesman Dan Spadoni said no one was injured and there are no homes within a mile of the well. He said polluted drilling water did not reach a waterway. About 1 million gallons of hydro-fracking fluid were released in addition to the gas. DEP secretary John Hanger told the press that his agency intends to investigate aggressively the circumstances surrounding this blowout. "The event at the well site could have been a catastrophic incident that endangered life and property," said Hanger, adding that it was not a "minor accident, but a serious incident." When DEP arrived on the scene natural gas and frack fluid was flowing off the well pad and heading toward tributaries to Little Laurel Run and gas was shooting into the sky, creating a significant fire hazard. Right now DEP is working to limit further environmental damage. "But once that work is complete, we plan to aggressively look at this situation and see where things went wrong and what enforcement action is necessary," Hanger said. "If mistakes were made, we will be certain to take steps to prevent similar errors from happening again." In addition to the Emergency Management Agency and DEP, teams from Texas were called to help control the situation and a command trailer was set up. DEP evacuated the area, including campers, and the Federal Aviation Administration issued a flight restriction in the immediate area shortly after 11am this morning.